This post contains major spoilers and ending details for Jumanji: Welcome to the Jungle. From the jump, Jumanji: Welcome to the Jungle is more clever than required. When Sony Pictures announced the quasi-sequel-but-really-more-of-a-reboot of the 1995 original film starring Robin Williams, itself inspired by a 32-page children's picture book, it looked like yet another attempt to wring the last few decades of pop culture for all the nostalgia it's worth. And, really, that's what this Jumanji is. But the movie boasts one notable move: a bonkers, time-loop plot twist that doesn't exactly hold up to close scrutiny but does pay tribute to the original movie. Which is fine! 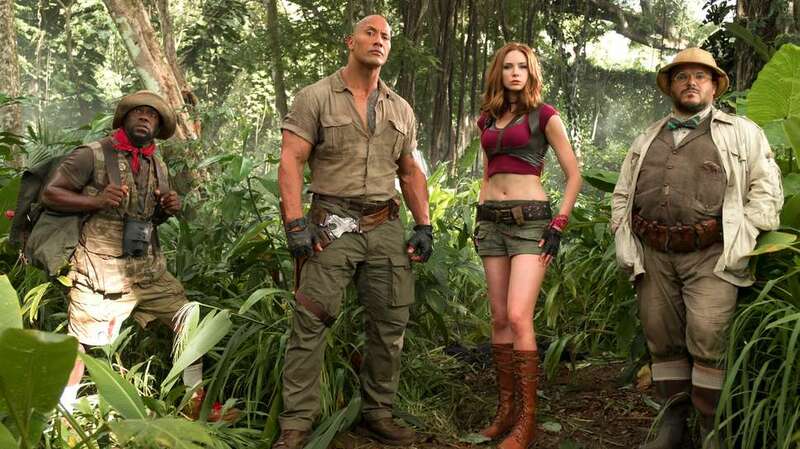 This is Jumanji: Welcome to the Jungle, not the latest Christopher Nolan brain-teaser, so it's unlikely that the movie's target audience of parents and children who already saw Star Wars will be annoyed by it's shaky logic concocted by director Jake Kasdan (Bad Teacher, Walk Hard) and his four additional co-writers. After all, this is a movie where a nerdy teen boy gets sucked into a video game and ends up in the body of The Rock. It has a scene where girl trapped in the body of Jack Black learns to pee standing up. There's a part -- spoiler alert for the movie's best gag -- where Kevin Hart literally explodes because he eats a piece of cake. Like this year's The LEGO Batman Movie, which was also co-penned by Jumanji co-writer Chris McKenna, Jumanji: Welcome to the Jungle wants to have its exploding cake and eat it too. The film both mocks the conventions of big-budget action adventure cash-in's and traffics in the same over-blown clichés. Let's take a close look at the twist and see if it checks out -- or whether it should be banished to Jumanji forever. What's Jumanji's big ending twist? In your memory, the plot of the original Jumanji is probably simple -- kids play a game, unleash Robin Williams, and CG monkeys ensue -- but the actual story is more complex. The movie opens with a flashback to 1869, then jumps ahead a century and front-loads a bunch of backstory about the childhood of Robin Williams's character Alan Parrish, who gets his own little shout-out in Jumanji: Welcome to the Jungle. For a movie that's mostly just an excuse to watch rhinos run wild, it's a relatively dense text. Staying true to the spirit of the original movie, Jumanji: Welcome to the Jungle opens in 1996 with a Metallica-t-shirt-sporting teenager named Alex Vreeke receiving the dusty, old board game from his father, who apparently found it on a beach during a run. (Jumanji-heads will remember the game was thrown into a river at the end of the original but also discovered on a beach in the movie's final moment.) Being a cool, jaded '90s teen, Alex says "Board games? Who plays board games?" and tosses the wooden box aside. Feeling rejected, the Jumanji game then transforms into a video game to attract the attention of Alex's metal-fried lizard brain. Surprise: It works and Alex ends up getting sucked into the game. Then the movie jumps to the present, introduces a whole new set of angsty teenagers in a Breakfast Club-like detention scenario, whisks them into Jumanji: The Video Game, and we don't see or hear from Alex for probably another hour in the film's runtime. Instead, the movie focuses on the nerdy boy Spencer who becomes adventurer Dr. Smolder Bravestone (Dwayne "The Rock" Johnson) in the world of the video game. Similarly, the selfie-loving Bethany becomes Professor Sheldon Oberon (Jack Black), the book-reading Martha becomes Ruby Roundhouse (Karen Gillan), and the football-playing Fridge becomes Moose Finbar (Kevin Hart). 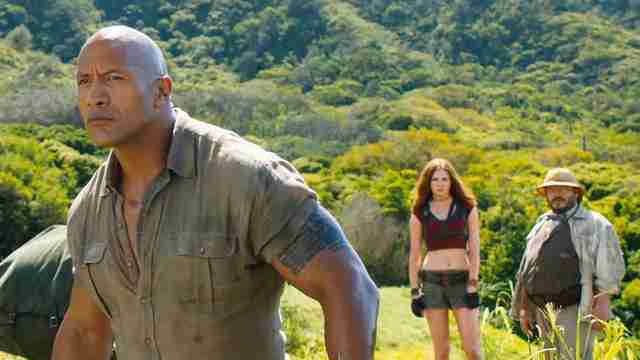 That's right: Jumanji: Welcome to the Jungle is also a body swap comedy! So, what happened to Alex? When the trailers for Jumanji: Welcome to the Jungle first dropped, some Nick Jonas fans were disappointed that the former Disney star turned adult heartthrob wasn't featured prominently in the ad campaign. Worry not, #JonasHive: Nick makes an appearance about half-way through the movie as Seaplane McDonough, a pilot who we eventually learn is actually Alex. Unfortunately, he's been stuck in the game for 20 years, which he hasn't realized because of the weird way time passes in the world. Anyway, he ends up helping our heroes escape the video game and develops a friendship with Professor Sheldon Oberon along the way. (I'm not going to parse the sexual politics of Jumanji: Welcome to the Jungle too closely, but there is a joke about Sheldon getting an erection after hugging Seaplane that feels airlifted in from some retrograde '80s yukfest.) While the main four teens end up back in detention, Alex isn't with them. Did he get shot out into 2017 as a teenager? Did he age those 20 years? What the hell is going on? Does the time-traveling ending make sense? So here's what happens: Spencer, Fridge, Bethany, and Martha, who have all matured because of the lessons they learned in the game, walk home together and pass by the house Alex used to live in as a child. Earlier in the movie, it's established through some exposition that the Vreeke estate has fallen into disarray and Alex's father (Tim Matheson) has become a recluse following the disappearance of his son. But in the new present, the run-down dump now looks fully repaired. Tim Matheson is no longer a scraggly guy. Now he's a yuppie! Something has obviously changed. A car pulls up to reveal an adult version of Alex (Colin Hanks) who still wears Metallica shirts but now has a couple of young kids of his own. (He's a cool dad.) He clearly remembers the teenagers from their shared experience in the game, and the kids clearly remember him. Alex even tells Bethany that he named one of his kids after her. That's right: It's a Back to the Future style ending where the present gets "fixed" by the time-travel shenanigans of the main characters. But the temporal math on this one is a little bizarre. Apparently, when Alex finished the game he was shot out of Jumanji back to 1996, but he also made sure the game was deposited in a way that means our main characters would still find the game in the future to save him. Why didn't he destroy the game or, like the heroes from the 1995 movie, toss it in a river? Wouldn't his arrival back in 1996 alter the chain of events that led to Spencer, Fridge, Bethany, and Martha finding the Jumanji game during detention? It's a classic time travel paradox, one that Jumanji: Welcome to the Jungle isn't exactly looking to solve. 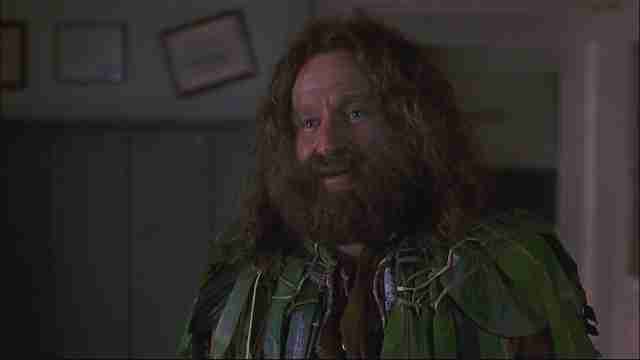 How does it compare to the 1995 Jumanji's ending? Welcome to the Jungle is somewhat true to the ending of the original Jumanji. That film also ends with an alternate timeline, with the game sending Robin Williams's Alan and Bonnie Hunt's Sarah back to 1969 so they can live out the rest of their lives. (Like Alex in the new movie, they also retain their memory of their time in the game.) The movie then cuts to the future and we see Alan and Sarah as adults at a Christmas party, where they are introduced to Judy (Kirsten Dunst) and Peter (Bradley Pierce), the children who initially freed Alan from the game in the future. When Judy and Peter's parents suggest they might go on a ski trip -- a vacation they end up dying on and leaving their children orphaned because of -- Alan yells "No!" and presumably saves their lives. It's a (very weird) happy ending. Now here's the thing: This is still a traditional alternate timeline plot. In the alternate timeline we see at the end of the original Jumanji, Judy and Peter have no memory of playing the game or ever meeting Alan and Bonnie. Why would they? Alan and Bonnie got rid of the game by throwing it in a river, ensuring that Judy and Peter would never find it. They created a different future. Compared to Jumanji: Welcome to the Jungle, this is a more straightforward temporal narrative. The convoluted plot mechanics of Jumanji: Welcome to the Jungle suggest that between 1995 and 1996, perhaps when the Jumanji board game morphed into a video game, the space-time continuum within the game shifted in a profound way. The exact nature of that shift goes unexplored, which is fine because, as noted before, this is a movie where Kevin Hart explodes by eating cake. It's not Primer. At the same time, is it unreasonable to hold the series to the same standard as the original? Maybe in 20 years when this property gets remade again -- probably with a cast of YouTube stars in the main roles -- we can finally get some answers.